A nursing home is expected to supervise a resident and provide security to avoid endangering a vulnerable adult. Wandering and elopement are unsupervised situations when a resident leaves a nursing home facility. Sometimes a resident leaves due to mistaken beliefs. A resident who suffers from dementia, Alzheimer's, psychosis, or another mental or neurological impairment is more likely to elope and may require greater supervision. In contrast, residents who have limited mobility are less likely to wander or elope. Therefore, mobile individuals with any condition that causes a mental impairment are supposed to be watched more carefully by staff. At Moll Law Group, our Chicago nursing home negligence lawyers can sue a facility for compensation if you or a loved one was harmed as a result of wandering or elopement. If a nursing home resident wanders or elopes from the grounds without anyone knowing, they are at risk of serious injury or even death. They may suffer a fall, be exposed to excessive heat or cold while improperly dressed, or wander into traffic and be struck. Wandering among nursing home residents is on the rise. 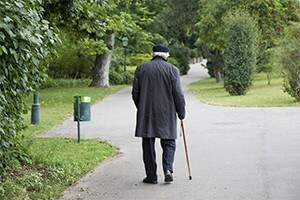 Vigilance by nursing home staff is critical to preventing wandering or elopement. Exits should be locked or equipped with alarms that work. The better a staff member knows a resident's habits, the more likely it is he or she will be able to respond appropriately to the resident and to door alarms to avoid the possibility of elopement or wandering. If you or a loved one was injured as a result of elopement or wandering that happened because a staff member was inappropriately trained or careless, you may be able to recover compensation by filing a lawsuit. The basis for the claim may be negligence, negligence per se, negligent hiring, or negligent training. Generally, residence in a nursing home is the subject of a written contract specifying the services the nursing home will provide, and usually one of these services is adequate supervision. If a nursing home fails to provide supervision to stop wandering or elopement, this may be a breach of contract. If you are suing on the basis of negligence, you will need to prove by a preponderance of the evidence that the nursing home or staff member owed a duty of care to the victim, the defendant breached the duty of care, actual and proximate cause led from the breach to the harm, and you suffered damages. If a resident dies due to injuries sustained while wandering, the personal representative of their estate may sue for wrongful death. In addition to common law theories, you may have a cause of action under the Illinois Nursing Home Care Act, which is a state law that applies to all residents in long-term care facilities. If you are able to establish a violation of the Nursing Home Care Act, you can potentially obtain compensation, attorneys' fees, costs, and an injunction ordering the nursing home to take specific measures to provide better security and supervision. In the case of egregious conduct by the nursing home, you may also be able to recover punitive damages. If you or a loved one has been harmed due to injuries sustained during wandering or elopement, the Chicago attorneys at Moll Law Group are available to vigorously pursue the compensation that you need. We represent people in Naperville, Schaumburg, Wheaton, and communities across Cook County. Billions of dollars have been recovered in cases in which we have been involved. You can contact us online or call us at 312-462-1700 to arrange a free appointment with a knowledgeable injury attorney.